Veggie galettes are a fun pizza like dish which little hands love to create. This past week, the downtown YMCA sent a group of campers from their Open Air Academy out to Crabtree for a farm experience. 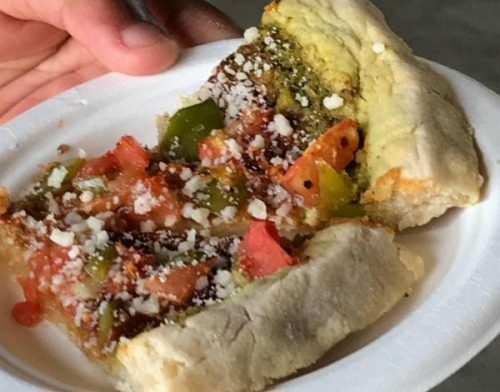 During their stay, they chopped up veggies, sunk their hands into freshly made dough, and munched away on this tasty treat. Put flour, salt and butter into a bowl and mix with a fork until it creates crumble pieces. Lightly flour a work surface and roll out the dough. Put the dough onto a baking sheet lined with parchment paper. Prick the dough all over with a fork at about 1 inch intervals. Brush on the herb infused oil over the crust leaving about a 1 inch border around the edges . Thinly slice vegetables. Arrange vegetables concentrically slightly overlapped or in rows over the crust. You'll probably have a few left over. Drizzle vegetables with olive oil, season with salt and pepper and sprinkle thyme over the vegetables. Bake in the oven for about 25 to 30 minutes until the crust is puffed/browned (including on the bottom) and the vegetables look softened. Once done, slide onto a cutting board, sprinkle with feta, and cut into squares or strips.